Niklas Asker was born in 1979 on a mountain in the north of Sweden. He studied painting in Örebro, then moved to Malmö in 2001 to attend the comics arts school. He now lives and works in Malmö. He has illustrated for IKEA, Microsoft, Tetra Pak, Dazed & Confused, EMI Music, Dagens Nyheter (Sweden’s largest newspaper), the Swedish Trade Union Confederation, and many others. His work has appeared in the Stripburger and C’est Bon anthologies as well as in the self-published short stories "Full Circle" and "Forest." 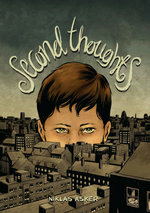 Second Thoughts, which began as Niklas’s university thesis, is his first graphic novel. He is currently working on a graphic novel adaptation of The City Of Ember for Random House (release 2012).